Online appliance store, Goedeker’s adds appliance installation as an extra convenience for customers. Discount appliance retailer Goedeker's headquarters located in Ballwin, MO. Buying major appliances online is a great convenience for consumers, but being able to schedule installation at the time of purchase takes convenience to a whole new level. Now, online retailer, Goedeker’s offers appliance installation. When visiting Goedekers.com, simply look for installation options on certain appliances. Goedekers.com is home of online appliance retailer, Goedeker’s. Since 1951, Goedeker’s has been providing hometown service to the St. Louis area. Now, Goedeker’s is proud to bring that same hometown service to the whole continental United States. 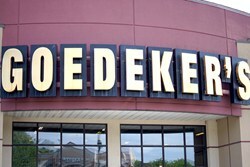 Whether it’s appliances, furniture, mattresses, or plumbing supplies, Goedeker’s sells it all. To explore GE Cafe Appliances, appliance package deals or many more fine home-related products, visit Godekers.com.